A month or so ago I started using Evernote, which could be described as a digital scrapbook-meets-notebook-meets-filestorage. The application and its basic use are free and available cross-platform, with a very nice web interface and client software for Mac OS X, Windows, iPhone OS, Blackberry and a few others. Anything that you add to your Evernote storage gets synchronized to all of your devices automatically. This means that the notes I took during my CISSP class were synced to my iPhone and that the web clippings I made at home can also be read online. And so on. It really is a nice service and there's no beating the price! Evernote also have a paid service, which adds extra functionality to your account. Your file storage space gets increased, the search function indexes any PDFs you store and your mobile Evernote client will be able to store all of your notebooks locally (instead of accessing them through Wifi or 3G). At $45 a year I wouldn't say the value's bad. 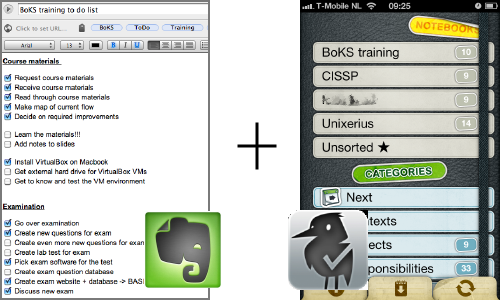 So far Evernote's been very, very helpful to me. Helpful how? Well, currently I have two distinct workflows I rely on heavily. On the one hand there's my studies for my CISSP exam and my security research. On the other hand there's my preparations for the BoKS course I will be teaching in a week. Since Evernote allows me to create multiple scrapbooks, it's a cinch to grab any Wiki pages I like, as well as any security PDFs and store them together with my CISSP class notes and my ToDo list. Similarly, for the training I have an easy ToDo list, many notes from teleconf phone calls and suggestions for new exam questions. All neatly taggable, searchable and editable. Ignore the troll. I get those sometimes as well; those type of comments meet a swift death to devnull.